This is part three in a series of four summaries of what I saw at TIFF 2012. 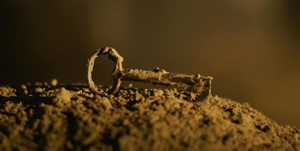 Personal favorites from TIFF 2012 are marked with an asterisk (*). The previous installment in this series looked at fantasy films I saw at TIFF. This time we look at reality — or at least what passes for reality on film. In particular, filmmakers in 2012 seem interested in stories of survival. 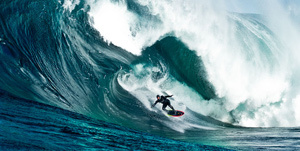 On this list there are documentaries that captured events as they happened (Storm Surfers 3D), documentaries that recreate what happened in the past (No Place on Earth), and documentaries that try to piece together what might have happened (Men at Lunch). 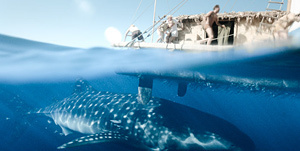 There are also a couple of feature films that take their inspiration from true stories (Kon-Tiki, The Deep). We start with a documentary made for History Channel Films. It’s introduced by a spelunker with a heavy New York accent, excited to be able to explore the gypsum caves of the Ukraine after the Soviet Union collapsed. He found fifty-year-old artifacts in the caves and predicted — correctly — that they were left by Jews who might have been hiding from Nazis. No Place on Earth tells the story of these Jewish families largely through reenactments, which is an approach I tend to dislike because it’s usually done poorly. This film manages to avoid the obvious mistakes of getting period costumes and hairstyles wrong. The reenactments are narrated by the survivors and their descendants. A nice coda takes those who are spry enough to travel, back to the caves. In case the historical story isn’t interesting enough for you adventure-film fanatics, the spelunker mentions offhand that these people hold a world record for continuous underground survival. Speaking of sea movies, Norway’s favorite Trivial Pursuit answer Thor Heyerdahl finally gets an adventure biopic. In the late 1940s, Heyerdahl sailed a hand-made raft, the Kon-Tiki, from the west coast of South America to Polynesia to prove that the islands were populated from the West, not the East. A great ensemble of Norwegian men populate the film — and the raft. Thor is the handsome leader whose best traits are faith and certainty. There is also a radio operator, a navigator, and a refrigerator salesman who talked his way aboard. I especially liked Knut, the ethnographer who wryly notes that as a Swede he feels out of place among the Norwegians, and who at one point catches a shark with his bare hands! Kon-Tiki is a straightforward adventure drama; it knows what it wants to do, and it does it well. There was another Scandinavians-versus-the-ocean film at TIFF, but in The Deep only one man survived. 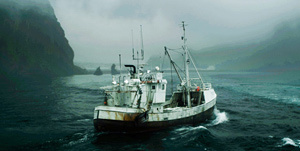 Based on a true story, The Deep shows the amazing survival of an Icelandic fisherman who swam three miles to shore in the freezing North Atlantic after a shipwreck. A fellow moviegoer told me that the shipwreck was filmed without using CGI. Two real ships were sunk for the movie. I had read about Gulli’s story in a book about winter survival. He was in forty-degree water for six hours, which “is impossible.” My book recapped the ordeal, then delved into the reaction of the incredulous scientific community and the battery of ice-water bath tests they put overweight Gulli through. These scientific experiments show up as the film’s second act, which changes focus from Gulli’s survival to the psychological toll of being found to be a freak of nature. The Deep does not follow the survival-movie formula, and audiences looking for feel-good, beat-the-odds heroes might not like the unhappy loner who is this film’s protagonist. Personally, I liked seeing an overweight, depressed protagonist in a genre where people like Gulli are usually the first to die. You might think that a documentary titled “Men at Lunch” would be a little boring. But what if you knew that it was about a single still photograph of men at lunch? Still not excited? What if you knew it was about the iconic photograph of steelworkers suspended over Manhattan? Couldn’t that be the foundation for an interesting feature-length documentary? No, you’re right, that’s a bad idea for a documentary. A few minutes exploring who the men were (we only have guesses at the specific identities of about four of the eleven men), a little background on what they were doing, a look at the building today (it’s “30 Rock”), and you’ve exhausted the attention span of most audiences. I suppose there are some people in this country who will insist on owning a copy of this movie, to keep next to their posters, postcards, and keychains. The rest of us can look at the still photo, pause for ten seconds, and move on to something else.